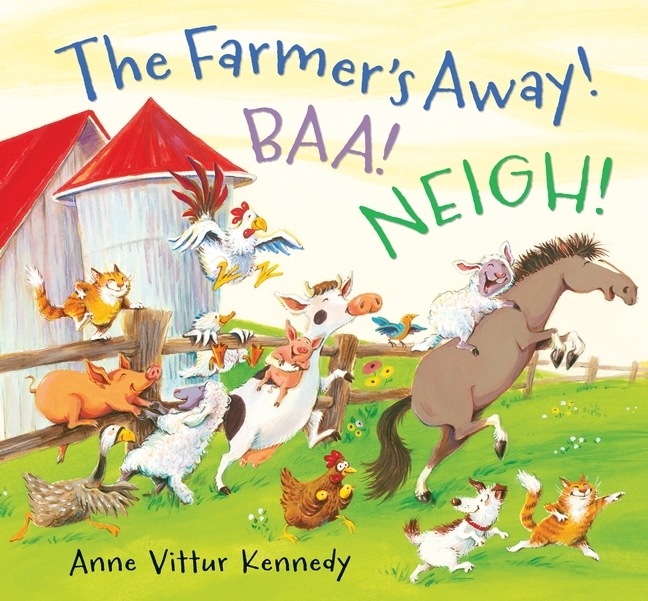 A picturebook a week: The Farmer’s Away! Baa! Neigh! When the farmer is away, the animals shall play …. and boy, don’t they have fun! From going boating to picnics, from rollrecoaster rides to ballroom dancing, the animals are having a whale of a time behind the farmer’s back! Much child participation is anticipated when reading this book aloud as the whole story is told in the farm animals’ own sounds, allowing even the littlest readers to take active part, especially as the text is so rhythmic. The Farmer’s Away! Baa! Neigh! is so full of fun and mischief and supported but humoristic and vibrant artwork (the wordless spread with the rushed chaotic return to the farm is fabulous), which gives slight anthropomorphic attributes to the animals while still retaining their primal attributes. The unusual text makes this a really gem and absolute delight to read aloud. Hopefully readers will then feel inspired to (re)discover another wonderful Walker Books picture book all about farm animals running amok while the farmer is away: Pig in the Pond, by Martin Waddell and Jill Barton. Thank you for dropping by, Anne! I can’t wait for the next book.